Once or twice before I've written about the usefulness of smartphones while birding. I personally own an iPhone (currently the iPhone 4 on AT&T) and use it nearly every time I'm in the field. Usually it's just to check CTBirds reports to see if anything really good has been reported. But the iPhone has many, many more uses for birders. I'll use my recent trip to Southern California as a prime example because never before had I needed to rely so heavily on the device. It seemed like a solid plan, with two days for Santa Cruz Island to allow for a weather cancellation, and the region's most reliable sites for Le Conte's Trasher and White-headed Woodpecker. Since I left myself multiple chances at most of my targets, I could probably absorb a day of crummy weather and still see most/all of them. Well, as the dates approached it became apparent that the weather would take a serious turn for the worse over those dates. Multiple lows, bringing heavy rain and low elevation snow, were going to sweep through the area from the Gulf of Alaska. The general forecast was calling for periods rain over a 2-3 day period, but forecasters did not know where and when the storms would hit. I was forced to play it by ear. I'll take it day-by-day and you can click on the date to view my trip report (with photos) for that particular date. This was forecast to be a pleasant day throughout all of SoCal, so there were no change in plans on this day. That evening, as I grabbed a burger and beer at Johnson's Landing in Salton City after dipping on the Pacific Golden-Plover, I checked the latest forecast via The Weather Channel and The Weather Underground apps on the iPhone. 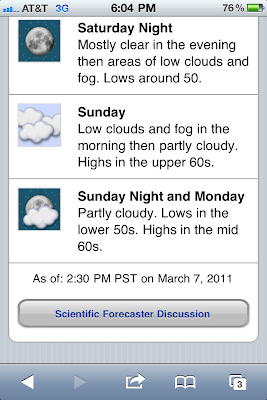 TWC app had only the basic forecast available. The Weather Underground, in addition to the same type of basic forecast, has a link to the "Scientific Forecaster Discussion" provided by the National Weather Service. 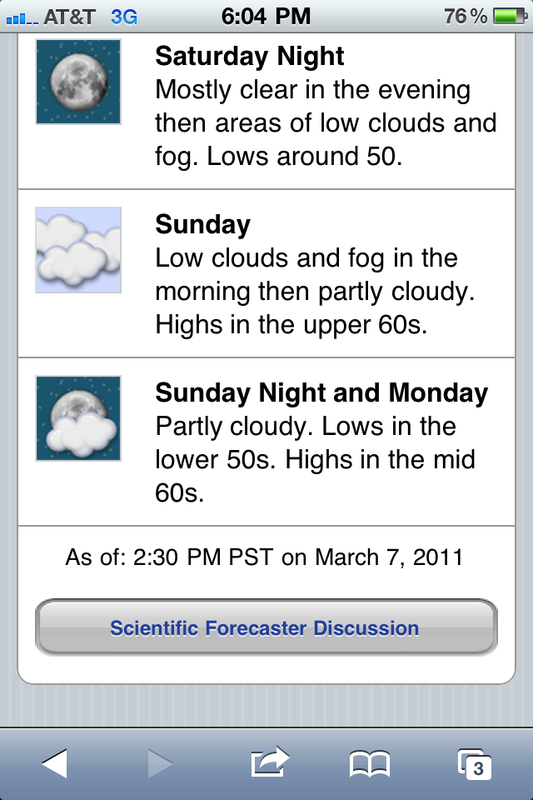 This forecast was SUPERB in its detail. Thankfully this report is not too dumbed-down like your basic weather forecast would be. In this report, the meteorologist predicted the exact timing, location, and intensity of the weather for the next couple days as best he could. He also mentioned the differences between particular computer models and relayed how much confidence he had in each. It was exactly what I needed to formulate a plan. The forecast predicted rain and wind in the LA area for most of the 18th into the early AM of the 19th. However the storm would be much later to arrive in the vicinity of the Salton Sea...getting there late afternoon on the 18th and lasting well into the 19th. SO, armed with this knowledge I realized that the trip to Santa Cruz Island would not be happening on the 18th and would be very questionable for the 19th because of persistently strong winds behind the front even if the rain ended early in the LA area. Now I realized that my plans for the next 3 days would have to be seriously altered if I wanted to salvage my trip. Thanks to the detail of that forecast I pulled out the books and iPhone to check for places to see my target species further to the southeast (in other words, away from LA and closer to the Salton Sea, where the weather would be arriving later). So, I pulled out the ABA/Lane guide to Southern California and first looked up Le Conte's Thrasher. 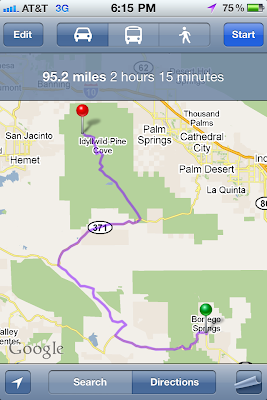 There is a spot, just one spot, to check east of Borrego Springs, which was less than an hour from my current location. But the book was published a few years ago, so I checked the internet via the iPhone for recent reports. I found a positive report from just a week prior on one of the listservs. I emailed the poster (again from the iPhone) to ask for more detailed directions if he had any. Next, I looked up places for White-headed Woodpecker near the Le Conte's Thrasher spot. I came up with the mountain town of Idyllwild, about a 2-hour drive from the thrashers. A cross-check of listservs came up empty, but I checked the BirdsEye app for any recent WHWO reports and came up with a few from the Idyllwild area. 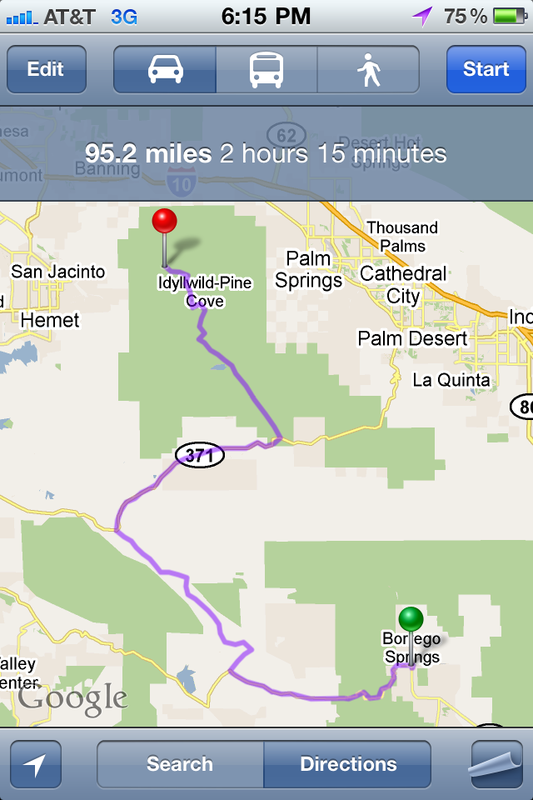 How do I get there from the Le Conte's Thrasher spot near Borrego Springs? Easy to find out! According to the detailed forecast, both of these areas would be precipitation-free for most of the day (unlike LA). Neither location is as reliable for the species as my original spots north of Los Angeles, but at this point this looked like my best (only?) option. So I crashed at a motel near Salton City, located by searching on the iPhone. When I woke up I checked my email on the phone and read a reply from yesterday's inquiry about the recent thrasher listserv posting, confirming the location and proving a couple useful tips. I arrived at the Le Conte's Thrasher site at dawn and had great looks at one. Later in the day, after a few hours of searching, I also turned up a pair of White-headed Woodpeckers in Idyllwild. Thanks mostly to the iPhone, I had seen my two biggest target species in the same day at locations far from the original planned spots. At this point it was mid-afternoon and I could continue 2 hours northwest to LA or 2 hours back southwest to San Diego. I checked the current radar loop on my phone and saw that LA was going to be rained-on for the rest of the day as forecast, so I wouldn't be able to bird at all there. I noticed that a band of rain was moving out of the San Diego area and appeared to have a good-sized pocket of dry air behind it. The only bird left for me down there was a Pacific Golden-Plover, but I figured that I would have at least an hour to look for it before it got dark as opposed to zero chance at birding in LA due to the rain. I got to San Diego just as that band of rain was ending and even caught a few brief rays of sunshine as I looked unsuccessfully for the plover. No bird, but the ability to view the radar gave me a chance at that bird I would not have had otherwise. I checked the detailed forecast again and realized that the Santa Cruz Island trip would again NOT be running on the 19th so there was no reason for me to drive to LA or Ventura for the night. The rain would be ending early in San Diego so I would take another early AM shot at the plover and then run north to LA for the afternoon. I again dipped on the plover in San Diego in the morning. Another check of the detailed forecast gave me another priceless piece of information: the final bands of heavy rain would be moving through Los Angeles during mid-to-late afternoon today. So I went straight from San Diego for my first of two target birds in the greater LA area. First, I got Spotted Dove without much trouble around noon. Now I was faced with another minor issue. The listserv reports of Red-crowned Parrot (LA target bird #2) only discussed their evening roost location. Here I was with several hours before they would appear at the roost, and with a decent chance that an evening downpour would screw up my plans. Here I pulled up the BirdsEye app again in search of any parrot reports from places other than the well-known roost. Sure enough there were a few reports away from the roost. I chose to stop at Tournament Park on the Caltech campus. It didn't take long to locate a few Red-crowned Parrots in the park. Storm clouds were building to the west...BirdsEye helped me get the birds just before the skies opened up. Another check of the National Weather Service forecast via The Weather Underground confirmed that tomorrow's weather would be pleasant enough for the Santa Cruz Island boat to run, so I drove up to Ventura for the night. The Santa Cruz Island trip went off without a hitch. 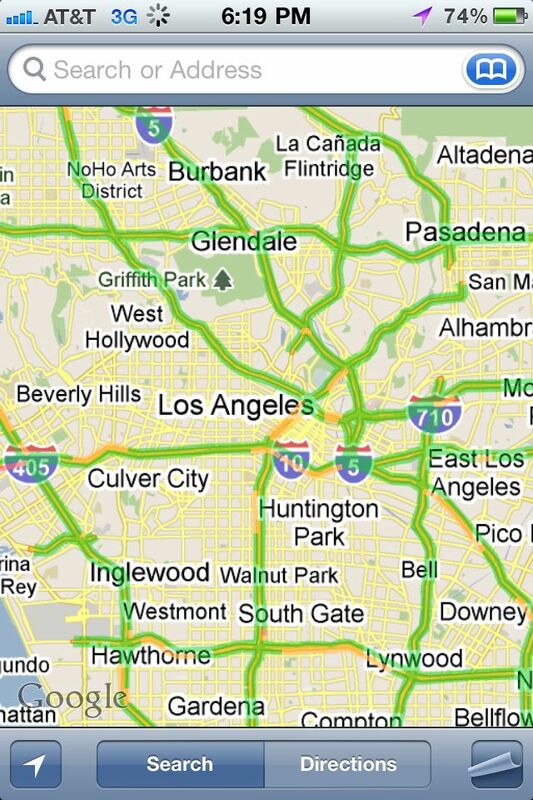 My only need for the iPhone today was to use its Traffic feature on Google maps to find the fastest route through Los Angeles on my way back to San Diego that night! Green for no delay, yellow for slight delay, red for major delay. 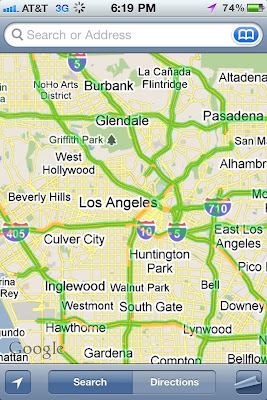 Lots of green, a little yellow around LA, but no red on the example pictured here. 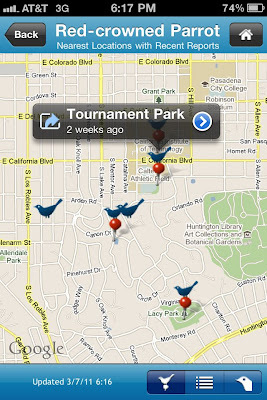 So that's how the iPhone saved my birding in California. 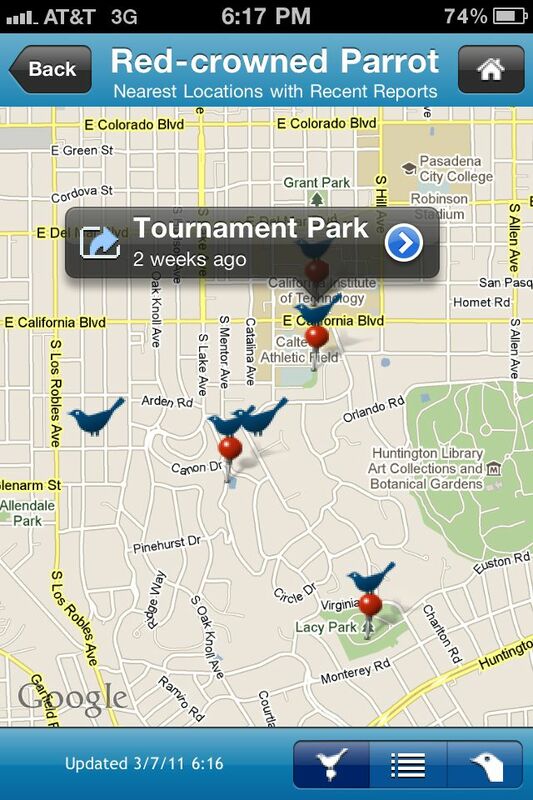 As you can see, quite a few features and apps are available for birders to use. I would think that other top smartphones out there offer similar abilities, particularly now that BirdsEye will be coming to the Android platform in the near future. LOL! How did people make plans before technology!!! LOL!